Loadmaster Truck Scales are high quality, commercial truck scales that can be customized to meet your business needs. We manufacture Above Ground Truck Scales, Portable Truck Scales, Pit-Type Truck Scales, Mechanical Truck Scales as well as Low Profile Axle Scales and PT 300 Series Wheel Weighers. The FT2 Above Ground Truck Scale is a free floating pit-less Truck Scale utilizing simple bumper checking. Variations on this vehicle scale include a portable (PV) and pit-type versions. As pictured to the left, the FT2 truck scale is 15″ tall with an unobstructed flat top. Optional Safety Rails are available. 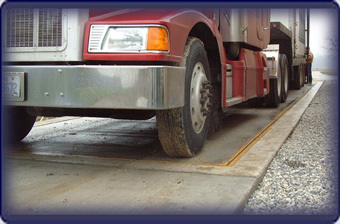 All truck scales in the FT2 line are NTEP approved, “Legal-for-Trade”. CLC (Concentrated Load Capacity) ratings include 35 and 50 tons. This full load cell vehicle scale is approved in lengths from as short as 8 ft to over 120 ft.
Portable version of our FT2 series truck scales. This vehicle scale is a full load cell, low profile, above ground truck scale, with a self contained frame. This truck scale ships in modular form, each fully assembled and pre-wired with quick disconnects. 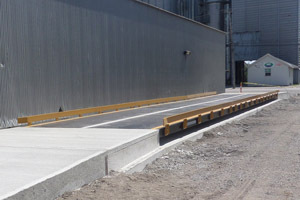 Installation is fast and consists of placing the vehicle scale on a smooth level surface, removing shipping straps and running a single cable from each module to a central junction box and from there to a digital weight indicator. This truck scale is typically ready to calibrate and weigh trucks in less than half a day! Ramping up to the scale can be done with either stone or with optional steel ramps. 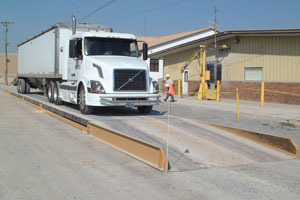 The pit-type truck scale is a full load cell system utilizing the same suspension assembly and simple bumper checking system as the above ground models. The standard pit depth of this drive-on vehicle scale is 4′. 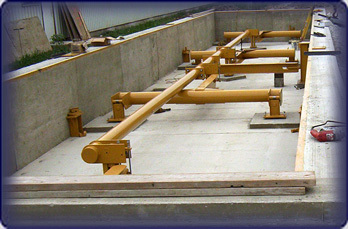 For retro-fits this pit-type truck scale can be supplied in custom sizes for pits as shallow as 2′. Built to last whether supplied with a concrete or steel deck. The LOADMASTER Low Profile Axle Scales. Available as individual platforms to weigh a single axle at a time -or- in multiple platform configurations to weigh entire trucks at once. Portable truck scale system with self-contained weigh modules, installed scale is an ultra-low 6″ tall. 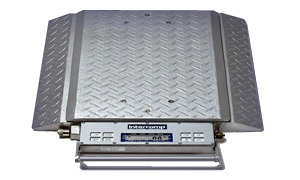 The PT300 Series of scales is a sturdy, all aluminum, fully electronic, self-contained wheel load scale that is available in capacities ranging from 5,000 lbs to 40,000 lbs. The scales are fully battery operated and will operate continuously for 8 hours without charging. A charger adapter is provided and can be accomplished with 12 VDC, 110 VAC or 220 VAC. It is possible to sequentially couple and obtain the toal weight of a vehicle. Individual scale weights are displayed and the last scale in the series will display the total of all platforms by activating the “TOTAL” switch.